This Winter Brunch Plaid Tablescape & Menu will have you hosting in style. Invite some friends over for a stylish brunch party with red & black plaid details. Get all the details here. Follow these tips and ideas for a Winter Brunch Plaid Tablescape & Menu to help warm up during these cold months. You know how popular plaid is during the holidays, but it’s a classic and neutral design that can take you all through winter entertaining. 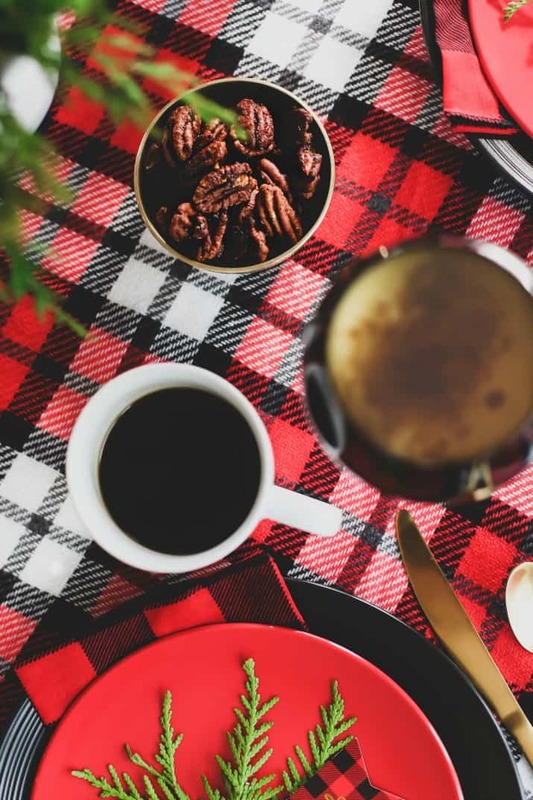 This red and black plaid tablescape can be used for so many occasions from a New Years Day brunch to a Valentines Day gathering. I’ve designed this table and menu specifically for a winter brunch because this is a great time for a relaxed gathering. Put another log on the fire, turn on some smooth jazz, and sip on winter cocktails! I’m sharing table styling tips, a delicious menu, and a cream cheese scrambled eggs recipe. All you have to do is text some friends to come over. Serve this Winter Brunch menu with the recipes provided. This menu is made up of classic comfort food. Breakfast meats, scrambled eggs, and bread pudding. Wash it down with a tasty cocktail or set up a coffee bar for guests to help themselves. A brunch cheese board is going to make this breakfast party a real celebration. Cheese and accompaniments are always a welcome choice for any meal. Set out small bowls around the table, filled with these sweet & spicy pecans. They’re a nice addition to the cheese board and add a festive touch. Guests can nosh on them as they like. My cream cheese scrambled eggs recipe below is easy to make. The scrambled eggs come out moist and delicious every time. Alternatively you could make individual sized mini onion quiche. Serve an array of breakfast meats. You can cook the bacon in the oven while cooking the sausage on the stove. Use some of the rendered grease to cook the eggs in and provide extra flavor. My eggnog bread pudding recipe is SO GOOD. If your store is out of eggnog this time of year, just make this classic recipe. For a tasty cocktail that’s as good with brunch as it is after 5:00, my winter white cocktail, aka “grown up milk” is perfect. If you want a holiday version try my coffee eggnog punch or pumpkin spice Kahlua coffee. I’m bringing plaid right into the new year and the winter season. It’s such a classic pattern that instantly makes you feel warm and cozy. If you’re mad for plaid check out these other stylish parties with plaid details: “snowed in” winter dinner party, set up a stylish pie bar, fall picnic. I set the scene with a plaid table topper, which is actually a winter wrap I found for about $8. Remember, items can always be used in ways that they weren’t intended. Another re-purposed item is the napkins. They’re actually cotton bandannas from Hobby Lobby! They look amazing, they do the job, and they’re about half the price of regular napkins. The next item on our re-purposed list is the place cards. These plaid tags were found in the gift tag section of TJMaxx. Instead of using the “to-from” side I used the back side to write names on. They match the table and napkins beautifully. Add a pop of greenery to your place settings with evergreen clippings. Then you can tie the place card onto them with bakers twine. This winter floral centerpiece was o great for this table but it was a little low profile for my liking. To give it more presence I put it in a white pie dish and placed it on a cake pedestal. It’s still low enough not to impede conversation but now it makes a larger statement. My go-to insurance policy for any tabletop gathering are these 36 conversation starters. They’re a free download and once you have them you can use them in a multitude of ways. Here I printed them out onto 3 coordinating sheets of scrapbook paper. After cutting them into strips I place them in a bowl and guests can pick one out to ask the table. They’re a lot of fun especially if all the guests don’t already know each other very well. Now that you’re all set up and ready to host a brunch party, these cream cheese scrambled eggs are terrific for guests or any weekend with family. It’s easy to cut the recipe in half for a family of 4-5. Use a blender to combine eggs, half & half, cream cheese, salt & pepper. Blend until frothy. Heat fat or butter in a large skillet over medium heat. Add egg mixture and turn heat down to medium-low; let cook until bottom begins to set. Use a spatula or wooden spoon to draw egg mixture across the bottom of pan every couple of minutes. Do not stir continuously in order to allow eggs to thicken and cook through. Transfer scrambled eggs to serving dish and top with chopped chives and serve. It look so cozy! Love the pretty florals!